This book came into my life in the fall of 2013. I threw it into my carry on bag at the last minute as I left to catch a flight to Big Island, Hawaii. This trip was not one with any kind of agenda, touring, or plan. It was meant for renewal, rest, and relaxation. The Big Island is the least commercialized of the islands of Hawaii, so it was the perfect opportunity! At the time of my vacation, I was unfamiliar with the power inside this little red book. One beautiful day on a beautiful Hawaii beach, I decided to take the book out of my bag. I read through it quickly, because the concept intrigued me. I am a woman of faith, and immediately began to “look up”, as the book suggests. I really didn’t get beyond that step, but I did finish the entire book on that Hawaii beach in November. Little did I know the impact it would have on my future. My life redirected shortly after, and I began to view myself, others, and the world with a different lens, and a new perspective. Upon returning to rainy and cold Arkansas, I rushed back into my school and life routine, leaving behind (for the time being) my reflective state and that little red book. The holidays were approaching and things were hectic. Shortly after Christmas day, I returned to the book, and decided to read it again. This time around, I took things slow. Lots of reflecting, jotting down thoughts, and using the book as a journal of ideas. By New Year’s Eve, my book was covered with tabs, highlights, messages to myself, and lists of possible words. Could I do this? The thought of focusing on only ONE word for a long amount of time was a bit overwhelming, especially for a “big picture girl” like myself! I remember searching deep within my soul, and found myself on my knees in prayer (a place I hadn’t been in quite some time). It was then that God revealed my word to me, and I have been sold on this process since. Each word has very deep meaning for me, and each has helped my journey as a Christian, wife, mother, woman, daughter, friend, and educator. Each word has been chiseled into my heart and soul. Each word has given me strength to continue my journey to who God wants me to be. The great part…I haven’t let go of any of them, even though every year has led me to a new word. THAT is the power of the little red book. These four words have helped to define my WHY, my purpose, my passion. It has always been there, but each year I have become more equipped to stay grounded in my faith, my core beliefs, and my values. Don’t get me wrong…there have been many struggles and hundreds of weak moments. Instead of allowing those times to get the best of me, the words have come together over 4 years as catalysts for gaining confidence, strength, humility, peace, and most of all…JOY (my life word). I really struggled with my new word. It didn’t just appear to me as the other words did. I’ve learned that each year, it has been a little more difficult than the last to dig deep and reflect on my one word. This was frustrating to me, as I kept thinking how familiar the process is now that I have pushed through it for four years. After some thought, I realized that it should become more challenging! The experiences I’ve created and had in 1,460 days have ignited more growth in me than in all my years combined. Each year has pushed me to become more purposeful when looking up, looking in, and looking out. Incessant. Incessantly. What a powerful word. I plan to use it to influence more than ever before, and to gut check myself in ways that give me strength to push boundaries as I never have in the past. I expect it to be TOUGH. I expect to make mistakes. I expect to succeed. I expect to learn. I will experience all these things…incessantly. 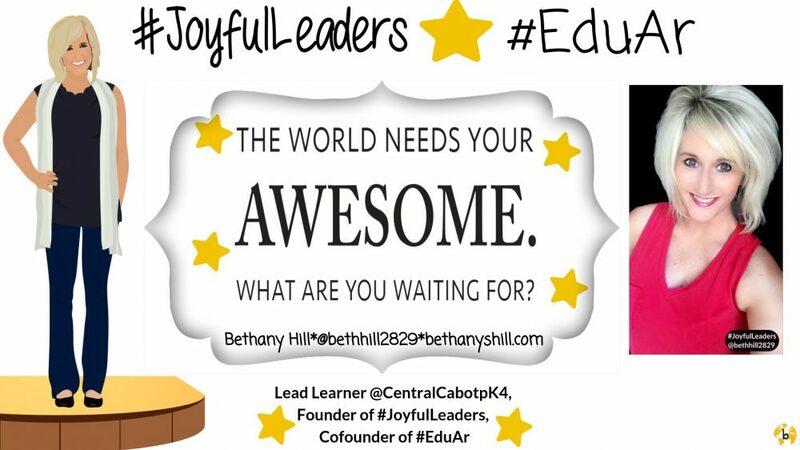 Family, friends, #CEtribe (my school people), and PLN…I need you. I can’t do this without you. I promise to invest in you incessantly. I promise to rely on you when I need support, encouragement, and accountability for my goals. In return, I will do the same for you. I am strong, but only because of the people I place around me. This entry was posted in #InnovatorsMindset, #oneword, education, growth mindset, Innovation, Leadership, professional learning, Reflection, Relationships, School Administration, school culture, social media, Vision/Goals and tagged #oneword2018, Education, goals, growth mindset, Leadership, pushing boundaries, vision. Bookmark the permalink. ← Culture of Consumption or Culture of Contribution?